With text from Roger Gastman and a foreword by SEEN. 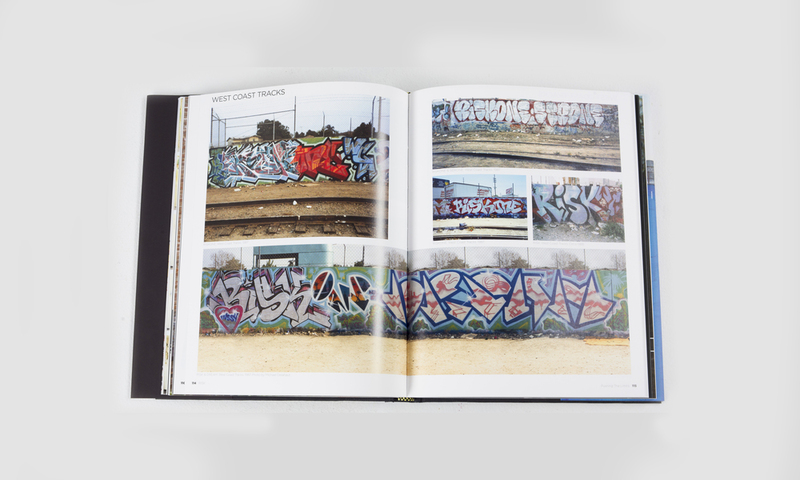 1xRUN is pleased to present the definitive book on Los Angeles graffiti originator and icon RISK. With a career spanning over four decades RISK recounts his history, failures, success and of course the many brushes with the law. Over 350 pages and 700+ many never-before-seen photos help navigate the reader through the story of Los Angeles graffiti and how it was shaped. From the very early 80s to present-day, RISK has not slowed down but instead has continued to evolve, remaining at the forefront of the culture. Over the years, many graffiti writers and street artists have come and gone, but RISK has established that he is here to stay through his constant progression and his willingness to stay true to his art. This book narrates his role as one of the pioneers of graffiti in Los Angeles and his aim to not only push the boundaries of his own art but also help elevate the graffiti movement to worldwide recognition. Interested in wholesale orders click here for more info. Roger Gastman began writing graffiti as a teenager. Since then, he has founded and published the pop culture magazines While You Were Sleeping and Swindle, with Shepard Fairey, as well as authoring more than two dozen art books including the landmark The History of American Graffiti (with Caleb Neelon; Harper Collins, 2011). Also in 2011, along with Jeffrey Deitch and Aaron Rose, he curated the blockbuster exhibition Art in the Streets at the Museum of Contemporary Art, Los Angeles. Gastman was also a producer for Banksy’s 2011 Oscar-nominated film Exit Through the Gift Shop. His recent curatorial project, Pump Me Up: DC subculture in the 1980s, was on view at the Corcoran Gallery of Art in Washington, DC, which doubled the museums attendance of any previous exhibits. It featured an extensive book length exhibition catalog and the premiere of his documentary, The Legend of Cool “Disco” Dan, played in conjunction with the show.